As I blogged last week, Tigerboy is a mostly silent child. After listening to what everyone had to say about his communication, I decided I would pop in to see the health visitors, who hold a handy drop in session in our local library. They weren’t very busy – there was one little boy ahead of us being weighed, and that was it. So we could take a little time and talk about Tigerboy’s lack of speech. He was very obliging, saying no, and mm MM, and that was about it. He looked at a book with me, and listened when I said come back, and demonstrated that he understands what is being said to him plenty of the time. He just doesn’t have any speech. He even showed off a couple of his signs – he won’t always do that on request. And at the end of all of that, they told me that he didn’t fit the criteria for referral to speech therapy, as despite what it says on the NHS site about speech development, that’s not what they’re looking for. They are looking for children with *no* sounds, no communication, who don’t interact at all. Rather makes me wonder what the point of the checklist on the site is. Certainly makes me wonder what the point of being told you should keep an eye on these things and ask for assistance if you’ve any concerns. One of them had a sheet on what the speech therapists would suggest. Apparently that would be baby signing (doing that) and one word exchanges, to make things easy for them to copy. I’ll make sure I build that in a little more. But basically I’m already doing lots of the early intervention interventions – I do lots of one to one with him, read books, play games, sign. So it’s just a case of watching and waiting. It makes me so angry. We *know* that the earlier we intervene in so many cases, the more you can achieve, the smaller the problem is, the lower the costs. And yet we systematically put it off. I’m an experienced parent – I wasn’t expecting a huge amount of help. I wasn’t expecting to be patronised by two people who just nodded at me a lot, and smiled a bit. Can’t see that I’ll be bothering with that service again. We’ll just keep on with our signing. 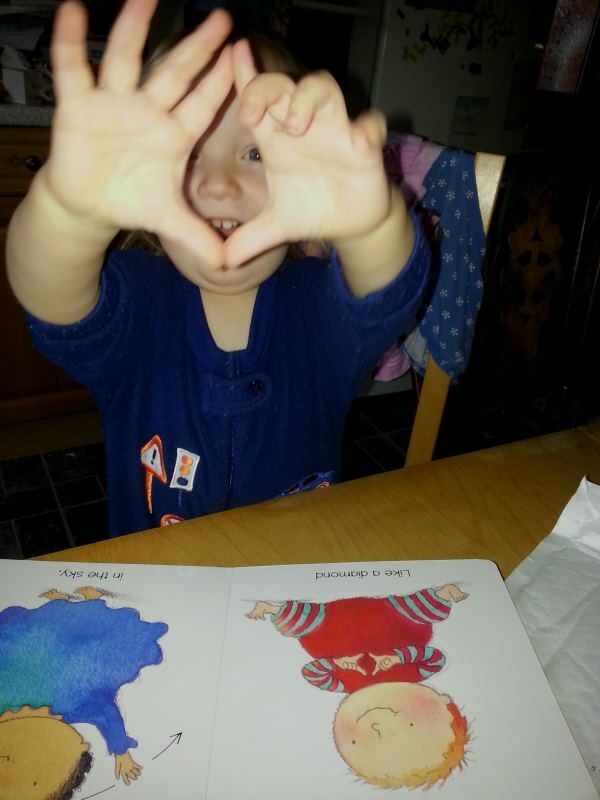 He learnt a new sign this week, from one of our signed baby books. Diamond. I’m working on twinkle with him too. So do I. Can’t wait to have a conversation with him. We had one who refused to talk at age 2. He had perfect comprehension, if he was in the mood he’d follow a set of spoken instructions so it wasn’t that he couldn’t hear or understand, he just chose not to talk. He totally failed his 2yr check and we were told that quite a lot of children did, but that they’d repeat it in six months because that caught most of the late developers. Of course, he could talk by then, but took a dislike to the strange woman who’d come visiting and once again refused to speak in front of her. So we agreed that she could go observe him at playgroup, and he duly passed. However, she considered that he was spending a bit too much time on a game compared to the norm, not being distracted and wanting to join in with the other children elsewhere, and did we want a referral to someone who could check up on that. Whoops! Alarm bells, the system is closing in. We declined that one. So don’t worry yet if he’s clearly understanding you. At some point they should be checking his hearing if it hasn’t already been done, which is the other quick test worth doing. I kind of get your point (and I’d love to hear more about the early intervention autism thing) but I suppose just for once I wanted someone else to take on a little bit of the load and say yes, we’ll look at that. Sometimes all of this is tiring, you know? arg! Very frustrating 🙁 From what I remember of SaLT at that age with Pol though, it was pretty much the guidance you have been given, except I was discouraged from signing as that would make her lazy…. And I think I recognise the book…. ah, happy days… I loved those sorts of books! I think the signing thing is a moving target to be honest, they now think it diminishes frustration and gives more room for communication to develop I think. It is so frustrating when you get treated like you’re an overprotective mother or something. I went to the GP about my eldest’s sleeping because it got so much of an issue, but it was wrapped in so many other things (emotional reactions mostly) that there was months of observations and experiences wrapped up in making that appointment, but it all gets ignored because yes there probably are loads of people who go to GPs and HVs over the tiniest things, and yet there are also loads of people who make careful observations over months, see how things are progressing, and then ask for help because we really need it. Grump! I think GPs often forget that some other people *are* as intelligent and clued up as they are. Or even more so sometimes. At least I guess you’ve done they ‘right thing’ but the response sounds annoying. Was wondering if any communication apps might help, or have you tried that? Haven’t tried that, any suggestions? My experience of health visitors has always been pretty rubbish – luckily I haven’t needed to have more contact, but every time I have I’ve found them patronising, a bit too stuck to the rule book, and not really listening ‘actively’ to anything I say. I guess all you can do it do what you’re doing -it sounds like you’re doing a great job already. As long as he is happy and well, the speech will hopefully come later. It is so sad that so many of them ate just going through the motions.